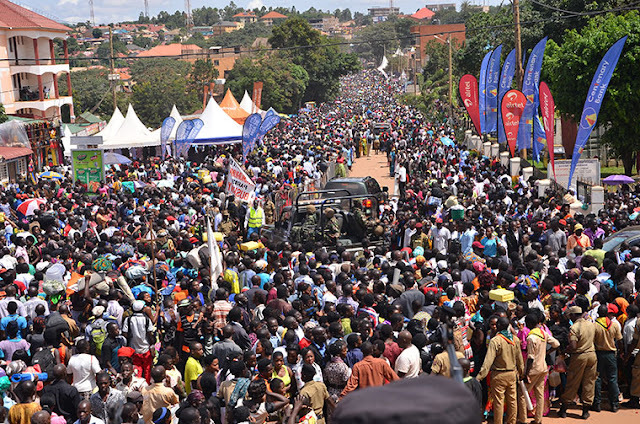 According to Police the estimate was 4 million pilgrims at the Catholic Shrine of the Ugandan Martyrs during their annual Feast. They came by plane, by bus, and on foot: pilgrims traveled for days/weeks to Uganda's Catholic shrine for the feast of the Uganda Martyrs, celebrated each year June 3. They gathered at the Basilica of the Uganda Martyrs in Namugongo, with most from Uganda, and many came from other countries, including Malawi, Tanzania, Kenya, South Africa, Nigeria, Zimbabwe, the Democratic Republic of the Congo, Japan, and the United States. The feast of the Uganda Martyrs honors 24 Catholic martyrs from the country, 22 of whom were killed between 1885 and 1887 under King Mwanga of Buganda, and two others who were killed in 1918 in Northern Uganda. The prayers to the Martyrs are said to be especially powerful and have been attested to by many of the faithful. “The blood of the Martyrs has drawn all of us here to Namugongo,” Uganda’s Archbishop of Tororo, Emmanuel Obbo, told a large gathering on Martyrs’ Day. Paul Samasumo – Vatican city. Organisers and local media have said that over two million people took part in this year’s celebrations to mark Martyrs' Day on Sunday, 3 June 2018. The theme for this year’s celebrations was: “Let Us Walk in the Light of God as a Family” (1 John 1:5-10). The Liturgy at Namugongo, Uganda’s holiest Catholic shrine, was animated by the faithful of the Archdiocese of Tororo. The Archbishop urged Ugandans to live lives that would make the Ugandan Martyrs proud. “The search for quick money by hook and crook –including kidnapping, human trafficking and what about Witchcraft and devil worship … These do not make the Martyrs proud,” the Tororo prelate said. In the last three years, Uganda has been rocked by an upward trend in kidnappings. Most of the abductions seem to be for ransom. This has led to a climate of fear of losing loved ones. Archbishop Obbo also made a passionate plea to Africa’s young people and told them not to allow themselves to be used as tools of political or criminal violence. He encouraged young people to stand firm in their faith as did St. Kizito, the youngest of the Uganda Martyrs. “The youngest, Kizito, like others demonstrated his readiness to die for Christ on that Ascension Day of Thursday, 3 June 1886. Before disappearing into the flames to be burnt alive with other Christians, he (Kizito) recited the ‘Our Father,’ together with others,” Archbishop Obbo said.